Chewing gum can be fun, especially the bubble blowing kind. Some chewing gums are bad for your teeth and others can improve your dental health. ​Which one are you using? When it comes to chewing gum, it's the type that you chew that makes all the difference to your teeth. Regular gum contains sugar and should be thought of like all other sugary treats. They increase the likelihood of cavities as your teeth are being exposed to sugar over a longer period than just at meal times. These gums may be fun but you should look for an alternative gum as we will now discuss. Now for the good news - Studies have now shown that chewing on sugar-free gum for 20 minutes after eating a meal or a snack reduces the chances of dental cavities. Chewing sugar-free gum stimulates saliva production which rinses off the teeth and removes food particles from the teeth, the saliva also helps neutralise acid that is released by the bacteria in plaque. Chewing gum can be even more effective at preventing cavities if the sugar replacement is Xylitol. Xylitol is a naturally occuring sweetener that inhibits the growth of Strepococcus mutans, this is one of the bacteria that cause cavities. When Xylitol is present in the mouth, the bacteria that cause cavities cannot attach onto the teeth stopping the cavity causing process. Over time the use of these gums can change the types of bacteria present in the mouth and then further reduces the chances of dental cavities. Some gum manufacturers are also adding Caesin phosphopeptide-amorphous calcium phosphate (CPP-ACP) to their products. This product remineralises and strengthens the tooth making them even more resistant to dental cavities. This is especially useful for patients who seem to need fillings all the time. 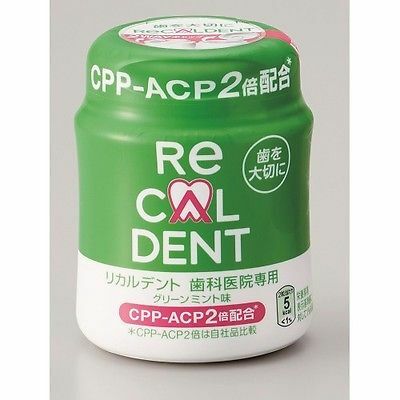 CPP-ACP is a naturally occuring protein which delivers calcium and phosphate ions into the tooth, repairing and strengthening areas of enamel which have been previously damaged by plaque bacteria. When you should not be chewing gum? Chewing sugar-free gum can be beneficial to more people there are a few who chewing gum is not recommended. For example if you are experiencing and jaw pain or temporomanibular joint disorders (TMD/TMJ) you should refrain from chewing gum and talk to your dentist to discuss what options are available to you. Chewing gum (even sugar-less) is not a substitute for brushing and flossing regularly. If you have any questions regarding the use of chewing gums or your dental health contact me today.